A New and Selected volume allows readers an overview of a poets career, presenting a representative selection of his work and giving an entry-point to the wider oeuvre. It has the function, too, of summing a career. 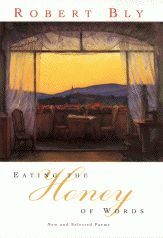 Robert Blys recent Eating the Honey of Words is a substantial and attractive book. It will probably introduce many new readers to his work, but it presents a very specific view of Blys career, emphasizing some aspects and ignoring (even editing-out) others. Thats quite right. Thats quite right. Im partly exhibitionist. But someone else said, "Robert, the only thing I like about you is that you educate yourself in public." And businessmen fall on their knees in the dungeons of sleep. Fall on their knees in the dungeons of sleep. Besides noting that the lineation of the edited poem works more effectively than the earlier version, and that the revision gives the final two lines a pleasingly motive internal rhyme, we also recognize that Bly has inserted himself in the poem. Whereas the version from Silence in the Snowy Fields loads itself on the anonymous open signifiers of "businessmen" and "bankers," in the later version Bly recognizes that he himself embodies the qualities and the failings he earlier sought to project onto these cultural stereotypes. This example demonstrates the older Bly coming to question some of his own younger attitudes and pronouncements. Indeed, in our interview he went on to say that the danger with learning about life in such a public way is that "theres a lot of error and theres a lot of false statements Ive made." Blys poems tend to fall more or less easily into several categories. There are poems of wilderness and solitude; domestic poemsone might call these hearth poems to further underline the distinction from the poems of the first category; love poems (of wilderness and hearth); "political" poems; philosophic and didactic poems in which Bly embodies some of the teachings of his prose books; and several more categories beside. Although there are a number of interesting poems in the earlier parts of Eating the Honey of Words, as the book progresses chronologically, real depth begins to replace tendencies toward superficial surrealist diction and political and worldly opinionatedness. In terms of the categories suggested, there is more philosophy in the later poemsa marked influence of ideas and images from world religions, especially Sufism and Christianityand the politics are of an older man, better thought-through and more empirical; the love poems too become more appealingly easeful. So, although there are a few outstanding poems here from Silence in the Snowy Fields (in the section named for that book and under the title "Early Poems"), I found my pleasure and my confidence in Blys abilities as a poet increasing as I read through the book. Oh, on an early morning I think I shall live forever! As the grass is wrapped in its clouds of green. It seems youve traveled years to get here. Sometimes they are quirky, as in "What the Buttocks Think" and "A Conversation with a Mouse," sometimes melancholy ("My Doubts on Going to Visit a New Friend"). All writers revise their work. Robert Lowell is well known for his compulsive editing and re-writing. Elizabeth Bishop fretted over poems for yearsan example being "The Moose," which she is reported to have worked at for twenty-five years before it appeared in the New Yorker, and which she revised again before publishing it in a book. It is perhaps exactly because they appear in a volume intended to sum a career that the revisions in Eating the Honey of Words seem so striking. Perhaps I overemphasize this point, but I feel it affected my reading of the book; I found myself stopping and seeking out the original versions of poems published in earlier volumes because the poems here didnt square with my memory. And while in some instances the revisions quite clearly improve the poem, one still wonders at the witness of a New and Selected that so reshapes the record of a poets career.